The Pelham bit is often used for horses that are too strong for a snaffle. 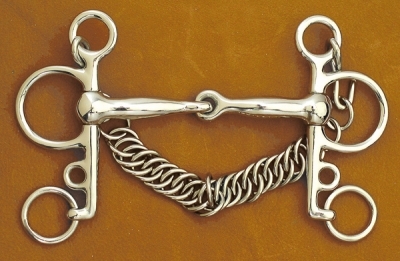 With the Pelham bit, if the large ring is used by itself with one rein, it acts like the lifting action of the snaffle, upward against the corners of the lips. If the bottom ring is used independently, we have a curb action. If both rings are used with two reins, the action will be somewhere between the two. Basically the Pelham is an incorporation of the Weymouth and Bradoon, and should theoretically be used with 2 reins, the first rein is attached to the snaffle rein, and the second rein attached to the ring at the bottom of the shank. 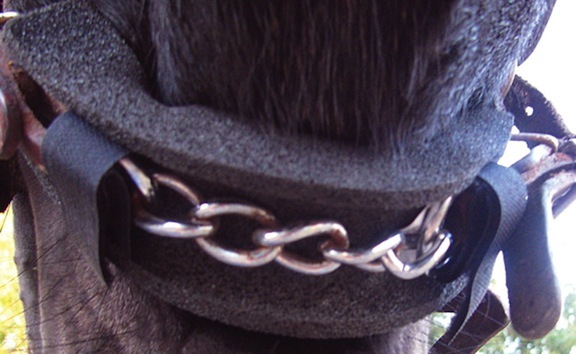 When the first rein is used the Pelham acts like a hanging cheek snaffle, putting slight pressure on the poll and various pressures in the mouth depending on the mouthpiece, when the second rein is used, this increases the leverage and lip pressure, and also the curb chain comes into play. The greater the distance between the cheek slot and the mouthpiece the greater the poll pressure, the greater the length of shank the greater the amount of leverage. The curb chain should be fitted so that the curb chain tightens when the second rein is brought into play, but there must be a bit of give so not to tighten too much.. The Pelham Mullen Mouth is a mild bit with leverage option. The straight metal bar act on the edges of the tongue and the underlying bars. Sizes: 6"
Made of the world's finest 18-8 (chromium/nickel) stainless steel. This alloy is best for bits because it extremely strong and resists salt and acids in saliva, and will never rust or spot. Size: 5 1/2", 6", 6 1/2", 7"
Cheek pieces are 4" from the top of the ring with the chain to the bottom The middle ring is 1 1/2" wide. The bottom ring is 1 1/4" This bit is made out of stainless steel with a 21mm rubber mouthpiece. Made of the world's finest 18-8 (chromium/nickel) stainless steel. This alloy is best for bits because it extremely strong and resists salt and acids in saliva, and will never rust or spot. Cheek pieces are 6" from the top of the ring with the chain to the bottom The middle ring is 2 inches wide. The bottom ring is 1"
Rubber Mouthpieces have a warmer feel to the horse’s mouth. Horses that do not easily accept stainless steel will sometime accept rubber. The rubber mouthpiece is also useful for a horse with sensitive bars or tongue. The rubber mouthpiece is a milder alternative than stainless steel because the mouthpiece is normally thicker; therefore the pressure is distributed over a larger area. A rubber bit may however be unsuitable if your horse has thicker fleshy lips and/or a large tongue. Wexford Bit Converter converts Pelham bit for use with only one pair of reins. CAVESSON/CROWN CHANNEL Cashel® foam pad carefully grooved down the middle to help stop rubbing and chafing under a cavesson. Can also be used under the crown piece of your bridle or under the noseband of your tiedown. Cut length to fit. 12” long x 3/4” thick. Sizes: .75 X1.5" or .75 x2"